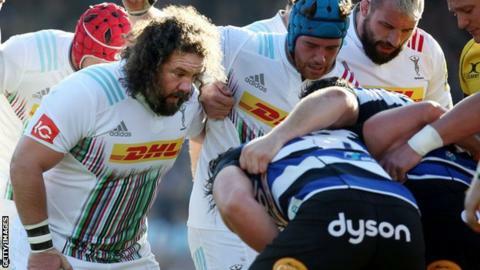 Former Wales and British and Irish Lions prop Adam Jones has signed a new contract with Harlequins. The 34-year-old, who earned 95 caps for Wales before quitting international rugby in January, joined Quins from Cardiff Blues during the summer. Three-time Grand Slam-winner Jones has made four appearances in the Premiership so far this season. "He has been, and will continue to be, a huge influence on the whole group," said director of rugby Conor O'Shea. "He is still a competitor who wants to win things and I have no doubt he will help us hugely in that quest." Harlequins are currently fourth in the Premiership, with four wins from their opening six matches, and top their European Challenge Cup pool with a 100% record.